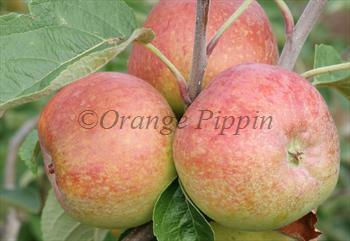 Irish Peach is a very early season apple, often ripening at the end of July or early August. It has good natural resistance to many of the diseases that affect apple trees. For such an early apple, the flavour is very good, although like all early varieties it really needs to be eaten straight from the tree. Please fill in the details below and we will let you know when Irish Peach apple trees are back in stock. 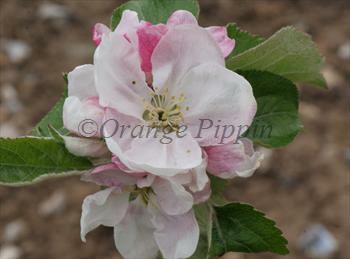 Irish Peach is in flowering group 2. Irish Peach is self-sterile and needs to be pollinated by another tree of a different variety nearby. Irish Peach is easy to grow, and the tree is very cold hardy by UK standards - in North America it is rated for zone 5, which means down to -29C. Cropping is usually good. It is a good choice for growers in areas of high rainfall. Irish Peach is a good example of a tip-bearing apple variety, with most (but not all) the fruit borne on the ends of branches. For this reason it is not a good variety for espalier training as the pruning needed to maintain the form will remove most of the fruiting tips. However for the same reason it is a good choice if you don't want to be bothered with pruning. The tree starts out fairly upright but becomes more spreading with age, a characteristic of many tip-bearing varieties, as the branches are bent down by the weight of apples.